In July of 1992, at the age of 14, I lost my dad. People always wondered how was I able to get over this without the typical issues, and I never had an answer for them. I sometimes even wondered if I had issues dealing with grief, like I had suppressed it or something, but I realized as I got older that I had dealt with it in my own way, without spraying graffiti, becoming an Emo kid, even without the random tantrums. I was able to get over it because of baseball, most notably the Montreal Expos, as my uncle managed to get tickets for us to go to Olympic Stadium in Montreal weeks after my dad's passing. 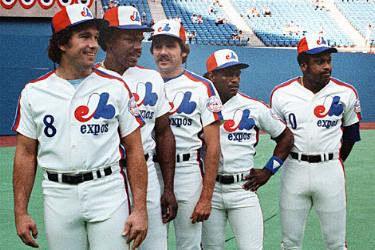 The Expos played in front of over 37,000 fans on a Friday night, and beat the Cardinals to stay a game and half behind the Pittsburgh Pirates for the NL East (this was back when Barry Bonds shopped in the juniors section). They got no closer, but they had a team on the field that was fun to watch. Gary Carter was playing for them, along with Delino De Shields, Larry Walker, and Dennis Martinez (just to name a few). I returned to Montreal a few times, but ironically my last game was “Dennis Martinez Day”, and even got the bobble head doll that goes along with it. Brad Wilkerson hit a walk-off grand slam that day to beat the Bonds-less Giants (which he recalls fondly in his interview with us), and my last memory of Olympic Stadium was 17,000 fans screaming and chanting. When the Expos played their last game in September of 2004, that grief came back, not so much for dad, but for the team itself. The Expos had been there for me when I needed them, and now they were gone. I had always wondered how to show my appreciation, and when this blog and pod cast started to get legs, I was able to come up with an idea to honor them, “Montreal Expos Appreciation Day”, a day devoted to everything Expos. When I first started approaching people, I was worried about being turned down, because who cares about the Expos, right? Well, everyone I contacted got back to me, and they all had memories and strong feelings about the Expos. From Jarry Park to Puerto Rico, you are going to hear some great stories and some great quotes. From Mike Marshall making fun of Willie Davis, to Jim Beattie's line about hoping Peter Angelos sells the Orioles, it was a great time. If you are a baseball historian, a fan of the Expos, or just a fan of the game, take a listen. You can almost hear the chants of “ole', ole', ole', ole'”, the smell of the Molson Export in 32 oz cups for 6.25 Canadian, and visualize Youppi dancing on the dugout as people speak French in the background. I want to thanks Jeff for booking many of these interviews, he did a great job helping me foster this through. I also want to thank Jay Stenhouse of the Blue Jays for getting me access for Brad Wilkerson, Bill Stoneman, Buster Olney, Jim Beattie, and Dr Mike Marshall for all taking the time to walk down memory lane. These interviews are available below. Enjoy, and always feel free to send me your thoughts to editor@centralmainesportsblog.com. Enjoy Expos Appreciation Week everyone!